You've come to a website that will change your life. 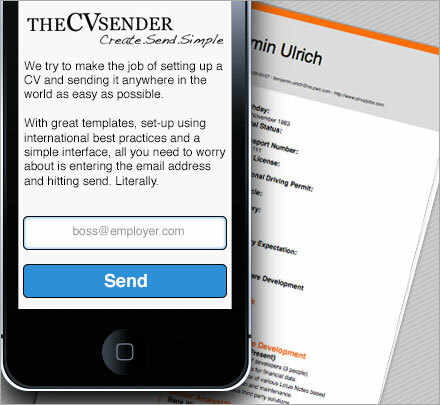 We make creating a proper CV, sending it and managing it very easy, and free. Dive right in and get started creating your CV. Creating a resume or curriculum vitae (CV) is tough. What goes where? Do I put this in or not? In the heat of the moment, many people miss important elements and chances to market their own skills effectively. Fact: A well formatted, professional looking and complete CV will you put you head and shoulders above the competition. Fact: In a flooded job market a potential employer is often left having to sift through hundreds of applicants. Many CV’s are disregarded or never fully read as a result of not displaying the necessary information at a glance. Fact: These days applications are accepted electronically, if an attachment does not go through, if a word document arrives scrambled you won’t be called or even looked at. Those are facts and with those realities in mind we created this complete CV and application solution. In a few minutes you will be ready to apply to a job with a perfectly complete and fully compatible CV. That is indeed potentially life changing. Imagine being able to sit with your mobile phone and the newspaper and in minutes send your resume to any number of positions that interest you. Your CV is going to be one of the first arrive on their desk, your resume is going to look professional and provide the exact information your could be employer is looking for. Best of all it is 100% free and the benefits do not stop there. Just by using our system you are potentially putting your CV in front of job agencies, employers and corporations. Even if your not actively job seeking, some one may find you! Site by Cranial Studios Marketing. © 2019. All rights reserved. Created in collaboration with Pin-Up Jobs Namibia.